Eulogy For A Country Church | "Northern Crossings"
Skjeberg Lutheran was a gem out on the prairie and was established 135 years ago. It was well kept and lovely and every time I drove by it I marveled at the spot where it was placed and the amount of upkeep that was obvious. On March 4 it burned down in a blizzard/lightening storm and I cannot imagine the trauma of the congregation that woke up and found their church gone. 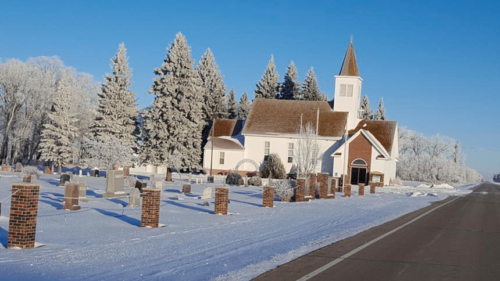 Congregations like these are scattered across Northern Minnesota and North Dakota. They are witnesses to me at least, of the pioneer heritage that we so often take for granted, and how the first thing after putting a crop in and building some kind of house to live in was building a church. “A Eulogy to a Country Church”. They carved a notch out of the prairie that could have raised a crop and at the boundary of the wheat field the plow was made to stop. Someone saw a vision of songs and hymns and prayers and a place to lay their blessed dead marked off just right there. They saw a cross topped steeple pointing up to the sky, and maybe a bell to toll the age of the faithful who would die. They would place them in that hallowed ground that could produce their bread, to await the coming judgment day and the return of Christ their head. Like corns of wheat they would plant them in that hallowed ground, to await the voice of the Angel and the mysterious trumpet sound that would signal the great harvest of the souls Christ died to save, and they would see the Savior face to face and dance out of their graves. Matriarchs and Patriarchs had these visions keen. How they got to this spot on the prairie and all the things they had seen. How they traveled from their homeland to get to this spot so fair, and what and whom they left behind – loved ones still back there. But they also had a vision of their sins and man’s disgrace and God’s love for them in Jesus who gave them a name and a place. He went to prepare a mansion in His Kingdom up above and they meant to build a church to memorialize Christ’s love. It would be a place where men and women would become husband and wife, and their children brought as babies would be baptized into Christ. Sins would be confessed, and then forgiven and gone. Dispensed would be the gifts of the Father and Spirit and Son. Prayers would ascend and hymns would be sung to give God honor and praise, and balm for healing the sick and bereaved would be offered in this space. Here the Holy Supper would be given and received and hearts would fill with wonder at Christ’s testament believed. What started out as vision became a building fit together with care. Standing on the foundation of Christ it became a house of prayer. At the center was always the Cross where Jesus bled out and died; a reminder of that blood that for our pardon cries. People would come in the winter and brave the snow and the sleet, in horse drawn sleighs covered with blankets and heated stones beneath their feet. In the summer the sanctuary provided some shade, and during the sermon the air would move from the fans the ladies had made. There are fond memories of Mission Fests and Harvest dinners, home made ice cream and pumpkin pie. If the next generation listens to one that passes away those memories will remain and those memories will not die. The beauty of the lights at Christmas, the somber darkness of the Tenebrae, the gathered flowers of Easter, the casket draping spray. In our minds eye we can see these things and in our hearts we can believe, that in the cross of Christ we glory, blessings given and blessings received. The church built on Christ will always stand even when steeples are falling. The old hymn wants to give us strength to remember our standing and calling. The steeple may fall and the bell disappear, the sanctuary burn and blow away. But the old ones’ visions still remain; “build on Christ the solid rock for He is our hope and stay”. Where Christ is, there is the Church. Beautiful poem, Pastor Seter. Thank you for this gift. You resurrected so many great memories. Thank you! Beautiful testimony of all our ancestors who came to this prairie and built churches for a place to worship and share their faith with the future generations to come.